Jhudora was still reeling from the shock of being told that she was going to become a powerful dark faerie when she finally found room 236B. Mostly about the dark faerie part. She thought about telling Fora or someone what had just happened, but she didn’t want to trouble Fora and something inside her told her to keep it a secret. “You’re late,” the Faerie Teacher said as soon as Jhudora entered the classroom. The Faerie Teacher wore a blue dress and necklace with some sort of a red jewel in the center. The Faerie Teacher had red eyes to match the jewel and black hair with some blue streaks. Jhudora’s first impression was that the Faerie Teacher was a dark faerie, but she immediately crossed that thought out. Surely the Headmistress wouldn’t hire a dark faerie as a teacher? Dark faerie or not, Jhudora was scared. Especially after the last encounter with Mis. Jhudora timidly approached. She felt the eyes of the whole class watching her every move. She wanted to tell them to stop watching her, but that would hardly be a good first impression. “Sit over there,” the Faerie Teacher pointed to an empty seat next to Ember. Jhudora quickly took her seat before the Faerie Teacher could change her mind and smiled at Ember. Ember smiled back. Ember quickly wrote a note and passed it. “Where were you? So glad you’re in my class. Teacher’s a bit creepy. Her name’s Fortune,” it read. “No passing notes in class,” Fortune said sharply, snatching the note away and glaring at Ember and Jhudora. The Faerie Teacher read the note, gave a second glare at Ember, and threw it away. So much for a good first impression, Jhudora thought. Fortune’s an odd name. “What are you holding! ?” Ember exclaiming out loud, spotting the doll Fora, the Headmistress, gave Jhudora. Her shout caught the attention of everybody in the class – and the wrath of Fortune. Gasps and hushed whispers went around the room. “Who gave the doll to you?” Fortune asked, quite irritated that yet another interruption by Jhudora and Ember had disrupted the class. Why didn’t I notice the doll before? Fortune thought, mentally slapping herself. “Fora. She said it might soothe me on my first day of school,” Jhudora said, afraid she’d done something wrong. “A... Faerie Queen Doll?” Jhudora repeated. She had never heard of it before. But she knew it was cute. She hugged it tighter. “It’s worth millions,” Fortune confirmed. Is Fora trying to stop the prophecy from coming true? Fortune thought. Fool. The class cheered. They lined up and Fortune took the class outside. Ember and Jhudora were at the back of the line. “My sister can fly and she says it’s really fun!” Ember said with a dreamy look on her face. It was a beautiful day outside, enough to make Jhudora forget about what happened before. Almost. “I will first do a demonstration of flying,” Fortune said. Fortune flapped her wings and flew high, diving and doing spectacular turns. She held the class’ attention fully. Jhudora nodded in agreement. She couldn’t believe somebody as grumpy as Fortune could fly so well. “Now, class, spread out and try to do the basic flapping. Flapping helps give you momentum before you fly,” Fortune said as soon as she landed. The class eagerly spread out. “Ugh! I can’t do this!” a faerie cried out in frustration. “Neither can I!” another said. “Flapping’s too hard,” Ember whined. Jhudora flapped her wings. To her surprise, she could control her wings. She flapped her purple a little harder and she started to float above the ground. I’m doing it! Jhudora thought excitedly. Ember was too busy trying to flap her wings to notice. Jhudora tried fluttering her wings faster, and she flew more than thirty feet above the ground! She moved slightly to the left and she turned. She tried doing a somersault in the air and she flipped! She was so amazed that she flew around in the sky as fast as she could. She laughed while she was doing twists and turns. Fortune noticed that Jhudora was gone at the same time too. That darn troublemaker! the Faerie Teacher thought. “Where’s Jhudora?” Fortune asked the class. Suddenly, somebody pointed to the sky. Fortune slowly looked up. Sure enough, there was Jhudora, flying about the sky. The Faerie Teacher was so shocked that she didn’t even move for a moment. The whole class had their mouths wide open. Jhudora noticed that the class was staring and started to fly down. 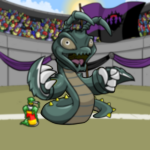 Wait a second... Jhudora thought, the realization finally hitting her. I was flying! And I’m a first-year! So am I... great? Just like what Mis said? Jhudora’s eyes widened at the thought as she floated gracefully to the ground. With Jhudora’s big lavender eyes widened and her cheeks slightly flushed from flying, Jhudora looked like the cutest faerie in Neopia at that moment. What pretty lavender eyes, Fortune noted. But that didn’t stop Fortune from scolding her. “What were you doing up there! ?” the Faerie Teacher asked. “You could have fallen!” Hah! Try to stop that prophecy now, Fyora, Fortune thought triumphantly. It’s already well on its way of being fulfilled. “I was flying,” Jhudora said wondrously, more to herself than to Fortune. The class burst into applause. “Come with me,” Fortune said, taking Jhudora’s hand and cutting the applause short. Jhudora and Ember exchanged looks as Jhudora was leaving the field. “Good luck,” Ember mouthed, sending waves of pity her way. Fortune walked at a brisk pace through the halls. Jhudora had to half-run to keep up with her Faerie Teacher. What did I do wrong? Jhudora wondered. Isn’t being able to fly as a first-year good? When the Faerie Teacher finally stopped, Jhudora looked up. They were standing in front of the Headmistress’ office. Jhudora was puzzled. Did Fortune want to tell the Headmistress so that Fora could praise her? That didn’t make sense, though. The Faerie Teacher seemed to hate Jhudora. “Come in!” the Headmistress called, banishing Jhudora’s thoughts away as Jhudora nervously bit her lip. The Faerie Teacher and her student entered and sat in the two plush sofas in front of the Headmistress’ desk. Jhudora saw “Faerie Furniture, located in Faerie City. Come visit us!” stitched into the sofa’s arms with a picture of an air faerie holding a faerie lamp. “Ah! Fortune! What brings you here?” Fora asked, hiding her surprise at why Jhudora was there too. “Well, Jhudora here just learned how to fly. Just like that,” Fortune said, snapping her fingers at the word ‘that’ for effect. Jhudora looked up. She expected some praise or some kind of reaction, but she was disappointed. She looked back down at the doll. Jhudora dreamed of having a doll made to look like her. She didn’t know what she would call it though... Maybe ‘Jhudora the Great Faerie’.